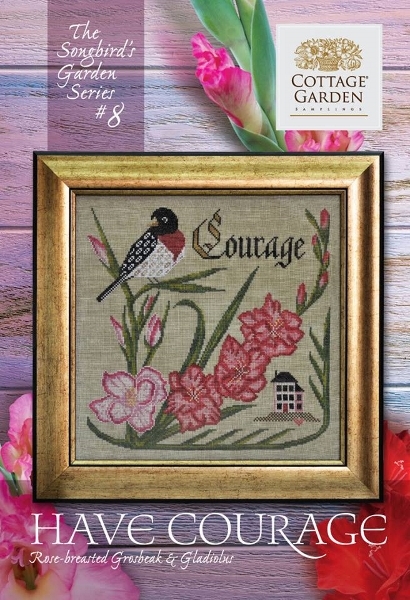 From Cottage Garden Samplings, the 8th in a series of 12 songbirds featuring Rose-breasted Grosbeak and Gladiolus. Shown stitched on 36ct Putty linen using Weeks Dye Works (Aztec Red, Baked Apple, Blackboard, Busy Lizzie, Chablis, Chestnut, Kohl, Madison Rose, Whitewash, Moss, Oak, Romance, Saffron, Schneckley & Seaweed) or DMC floss; the stitch count is 159 x 159. ***We have an auto ship club so you can get all 12 in the series if you wish .. or of course, you can just order the individual birds that strike your fancy!